Water source quality can be preserved by utilizing good water source protection practices. What is Water Source Protection? There are many pollution problems which may threaten drinking water quality, invluding quality at the point of collection, or during transport. Source quality protection can reduce or eliminate the risk of contamination, resulting in improved water quality and reduced risk of disease. 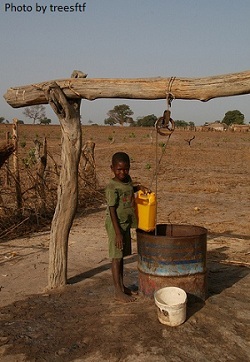 Source protection should always be practiced as the first step in the multi- barrier approach to safe drinking water. The following provides suggestions on several things that can be done to protect different water sources from contamination and improve the quality. * Locate latrines downhill and at least 30 meters away from water sources. * Use a separately designated, clean rope and bucket, a windlass or a hand pump to pull water out of the well. Store the bucket in its own covered clean platform. It is vital that people collect water in clean containers and keep them covered while transporting water from the source to the point of use, to prevent water contamination after collection. Containers used to transport water should be dedicated to that purpose and never used for other activities. Return to "Water Treatment" from "Water Source Quality"